How much privilege is too much privilege? It is a parliamentary convention, upheld in law, that parliamentarians can make defamatory and libellous statements inside the Chamber without fear of being sued. This is so that debate on issues can be without fear of repercussions and can be robust and emotive as well as factual and well considered. But defamatory comments can be ruled unparliamentary and the offender asked by a Speaker to withdraw the remarks, without reservation or elaboration. To fail to do so can incur a Speaker’s wrath and usually results in a period of absence from the Chamber. Committees of parliaments are covered by the same protections and are often abused by self-seeking, rash or irrational Members and Senators from time to time. The sadness is that those offending Members and Senators have abused a unique privilege given to parliamentarians and it diminishes not only their parliament but also themselves. We saw only earlier this month Jeremy Hanson, in a rush of blood to the head, accuse the Chief Minister of corruption. It was not even an accusation by innuendo. It was a direct claim that the Chief Minister financially benefitted personally from revenue derived from rates increases. If Mr Hanson had uttered these ridiculous accusations outside the Chamber or outside a Committee Room, the Chief Minister would have instructed lawyers to sue for defamation and/or libel and he would have won, and Mr Hanson would have incurred a massive penalty. Further, hiding behind parliamentary privilege to defame a person is the most cowardly act a Member or Senator can deliver. All too often we see pollies outing people, without facts to back the accusation up, the media picking it up and the accused suffers trial by media. And in this dubious courtroom, the accused is usually found guilty and executed. The ACT has been corruption and scandal-free since birth, no matter what Messrs Hanson and Coe would have us believe. I sit and wonder what really goes on in the minds of people like Mr Coe and Mr Hanson. Sometime ago, I wrote about the difference between being a politician and being a parliamentarian. I said that politicians are most often the servants of their political parties and are dedicated to gaining power for its own sake and not for the good it can do. A parliamentarian is the servant of the parliament and through it, the people. The political party is the vehicle which enables the parliamentarian to exercise influence on behalf of the people. On the ground though, the aspects of each play out in different arenas and parliamentary processes. For example, politicians inhabit Question Time. It is merely a point scoring exercise. Questions are dodged, ‘Dorothy Dixers’, employed, emotive language and increased volume are the go. Hot air and not much else. But later on, when the QT dust has settled, legislation is debated respectfully and passed or referred to Committees for further examination and report back to the particular Chamber. More legislation is passed by parliamentarians than are blocked by politicians. The happy hunting ground for parliamentarians should be the committee system. It is here that only a few pollies, usually proportionally represented according to the party they belong to and its numbers in the House, get together and forensically examine an issue and report to the parliament. It is here that the politician is left outside and the servant of the people rises to the occasion. Such was the case in the ACT Legislative Assembly during the period 2001- 2004. The committees were made up of one member from each segment of the Chamber, the Government, the Opposition and the cross-bench. The chairs of the committees were distributed proportionally to numbers in the Chamber and with regard to conventions. For example, the Justice committee was chaired by the Opposition as was the Public Accounts Committee, which was chaired by the Shadow Treasurer. Sure, a robust debate occurred, and often a heated examination of ministers and officials happened but parliamentary privilege was never necessary because of the mutual respect across the room. There was no need for the coward’s way out. This collegiate method of committee work slowly disappeared after 2004 and now is in the distant past. Mr Hanson has put that collegiate approach to committee work, and the notion of a parliamentarian serving on a committee, to the sword. Committees are not the playthings of the Chair. Mr Hanson was way out of line when in response to Mr Pettersson he said “this is my committee Mr Pettersson and I will make the rulings, thank you very much”. Chairs are the presiding officers of committee hearings and meetings, but they do not make the rules. Standing Orders make the rules and Chairs can interpret them as part of the job but they had better get it right. A prudent Chair will take advice from the Committee Secretary (who usually has far more experience and expertise in Standing Orders interpretation than most pollies). Despots make the rules up as they go. Mr Hanson’s behaviour in the Committee last week has taken ACT politics to an all-time low. My criticism of the Government in the past has been that they have been too soft on this type of behaviour. I urge them to move a motion of censure in Mr Hanson for the outrageous accusations and the appalling behaviour as a chair in a parliamentary committee. This is serious stuff but I have no doubt that Mr Hanson and his colleagues will wear a censure as a badge of honour. But being a bully and a mudraker is not honourable and there is no honour attached to libellous and defamatory accusations made under parliamentary privilege. 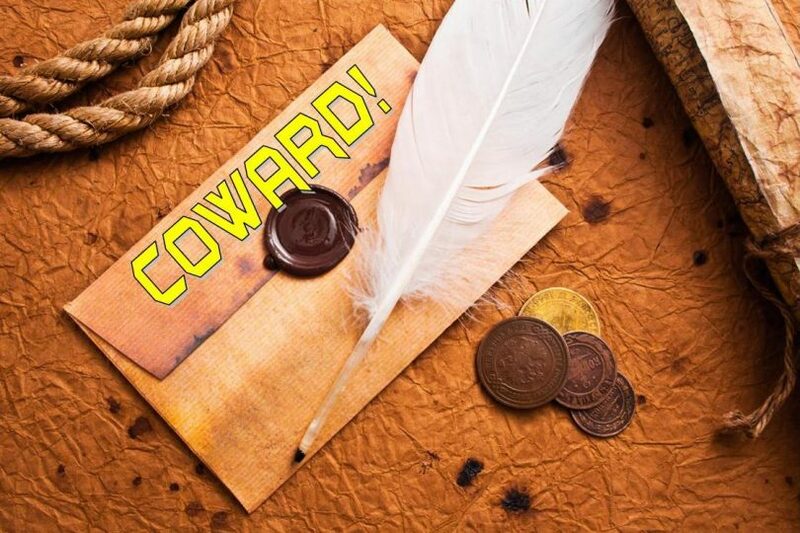 Cowardice is cowardice and only worthy of a white feather. Do you think Parliamentary privilege is being abused by our Members and Senators? Let us know your thoughts by commenting below.